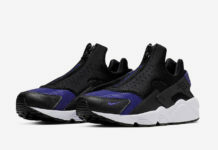 Made iconic by Michigan’s Fab Five, the classic Nike Air Flight Huarache silhouette is making another return, but this time as a low-top build. The shoe features a White leather upper with a mixture of Blue and Berry accents on the neoprene bootie. Other details include a Black and Berry heel counter and strap that sits atop an icy translucent outsole. Check ou the detailed images below and look for the Nike Air Flight Huarache Low “Bold Berry” to release in January 2016 at select Nike Sportswear retail stores. Previous articleCommunity Poll: Has Kanye Officially Jumped Over The Jumpman?